Yesterday saw the soft opening of Shortstop Coffee & Donuts, a cafe in a sidestreet off Little Lonsdale bringing next-next-level donuts to the hungry masses. 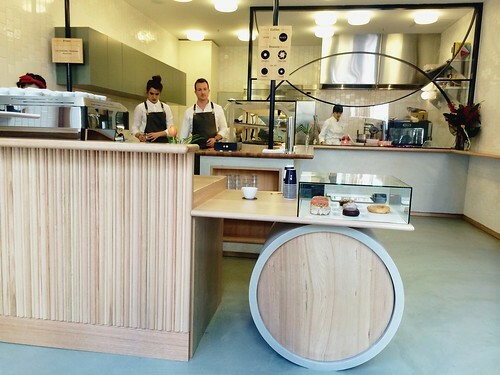 Shortstop is the brainchild of Anthony Ivey (who just under a year ago teamed up with the guys from Doughboys Doughnuts to run Melbourne's first coffee-and-donuts pop-up) and his kitchen guru Sinye Ooi. 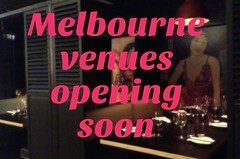 Open Monday to Friday (sorry, weekenders), but with plans to open on weekends down the track. Much like Anthony's previous longtime employer Market Lane Coffee (which serves specialty coffee, no decaf, no skinny milk, no tea), Shortstop has a similar purity of vision coupled with an absolute dedication to quality. 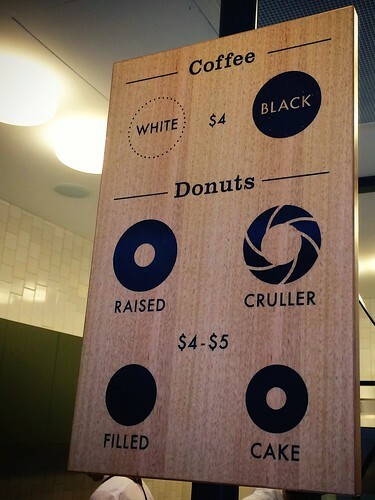 They do excellent coffee and they do excellent donuts, and that's the whole menu. The meticulous consideration that Anthony and his team have given every step of the project - the extensive overseas research followed by months of recipe testing, the selection of flavours and ingredients, the chic fitout, the branding etc - has been evident to those of us who've followed Shortstop's realisation over the last year. The coffee is Market Lane, natch, and you can have it black or with Schultz organic milk. 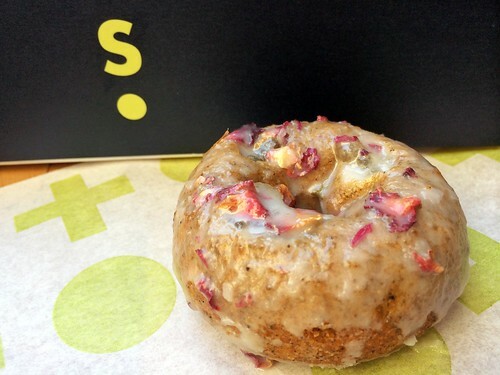 In addition to the fluffy yeast-raised ring and filled donuts more commonly seen around Melbourne, Shortstop is serving cake donuts (made from a moist crumb cake batter) and French cruller donuts (made from choux pastry and piped by hand). 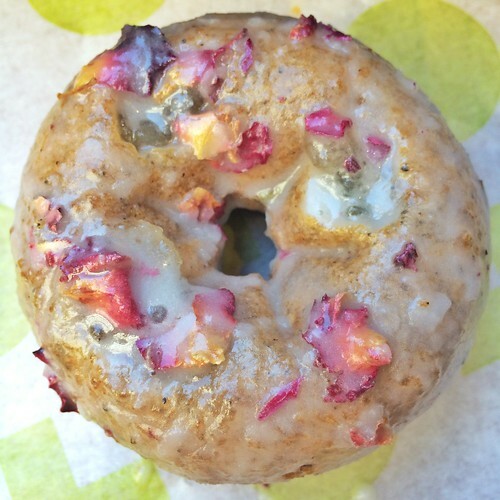 I tried a few cake donuts on my US trip last year and wanted to reacquaint myself, so I tried the beautifully perfumed Earl Grey and rose: Earl Grey cake with an injection of lemon myrtle and a rose water and rose petal icing. 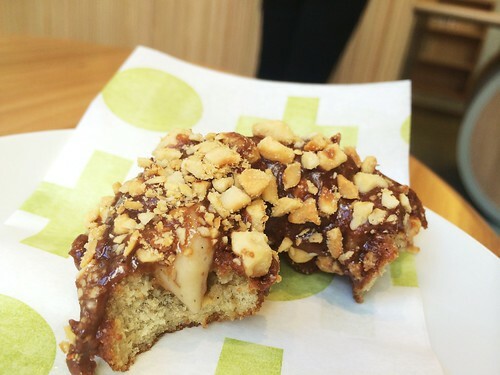 What really stood out for me was the nuanced flavour of the dough - in my experience, some of the other fancy donut places around town tend to coast on the flavour in their glazes or toppings, with somewhat flavourless dough. That wasn't the case here. I also had a taste of the banana and chocolate hazelnut cake donut (I'm breaking my usual rule about photos of half-eaten food in order to show you the banana cream custard hiding inside). Shortstop makes its gianduja (Nutella-like spread) from scratch. Totally worth the sugar headache I had later in the day. A heads up before you visit: don't be surprised if there's a queue. And although the generously staffed kitchen will be baking fresh batches of donuts continuously throughout the day, some flavours will probably be unavailable when you saunter in. The good news? 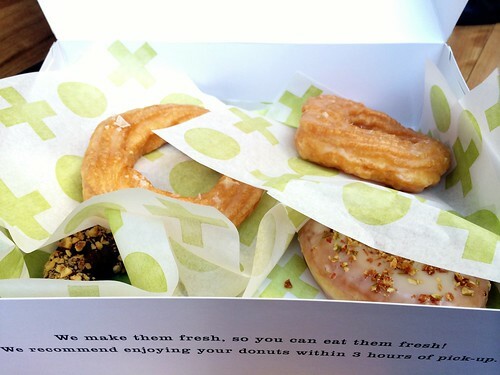 To be guaranteed the flavours you want, you can pre-purchase your donuts the day before (orders placed by 1pm can be collected the next day; minimum of 5 donuts per order) via Shortshop's nifty website. Everybody wins! Ohh I didn't realise they'd opened yesterday!! ARGH so excited!! Will be dedicating a lunch break to them soon I think! My friend was telling me about this place as he knew I would be interested - he's an accountant, and I think he works with the owners on their business accounts! 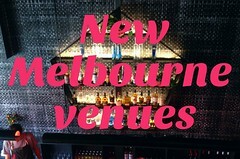 I'll definitely have to drop in next time I'm in Melbourne.